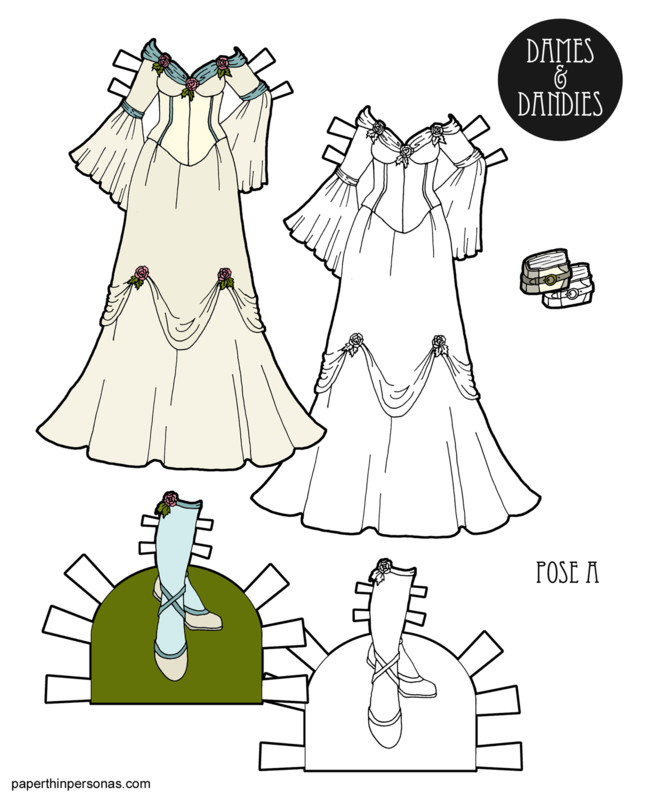 Printable Black & White PDF Printable Color PDF More Paper Dolls & ClothesWhenever I post a wedding gown I seem to start by saying that I don’t often draw wedding gowns. Yet, since I seem to have posted several wedding gowns this year, maybe I should stop saying that. I guess what I would say is that I was never one of those people who was obsessed with weddings or wedding gowns. I like pretty dresses, of course. I draw a paper doll blog for goodness sake. But there’s a ton of baggage wrapped up in wedding dresses. I think that’s part of why I have such mixed feelings about the genre. The medieval wedding gown here is part of the Fantasy Maiden Series. Fundamentally, there’s no reason I couldn’t have recolored it in bright purple or something and not called it a wedding gown. However, the source gown was described as a fantasy medieval wedding gown and who am I to argue? As long time readers will know, I am a wee bit obsessed with bridal trousseaux and I kinda found myself thinking of the Fantasy Maiden Series in that context. Once I did that, I knew I had to draw a wedding gown. While this certainly isn’t the last of the Fantasy Maiden Series, I thought it might be neat to see all the gowns together. It’s very easy for me to lose track of what I’ve done and feel like there is never enough. So, for me, putting together these little galleries reminds me that I have achieved something. That there are a few different gown options. It’s helpful for me to see things as a collection and not just a series of posts. I hope it is helpful for you all as well. What do you think? Should I keep going with the series? Comment if you like and let me know. I’d like to add a Happy New Year to everyone who (like me) is celebrating today. Shana Tova! Happy 5779! May you all have a sweet wonderful year. I like your little galleries — it’s helpful to see the outfits together. And these gowns today are soooo lovely. Thanks! Beautiful! I love the delicate colors on it. It would be perfect for spring courtship.